In 1934 the Department of Highways began a major infrastructure project to improve the Trunk Highway system throughout Nova Scotia. Paved highways would make it easier for motorists to travel and would encourage and accommodate increased traffic, particularly on tourist routes. More importantly for Depression-era Nova Scotians, the paving projects would provide much-needed employment opportunities across the Province. Paving the Trunk Highways was an expensive endeavour, costing more than $3,000,000 of the department’s Capital Expenditures annually. The right type of crushed gravel and rock (aggregate) used for pavement was expensive and difficult to find in some areas of the province. The department experimented with different types of hard-surfacing aggregate, depending on the types of gravel and rock available in specific areas where they were paving. In order to save costs on projects of significant length for which there were no low-cost bidders, the department also built its own paving plants and carried out its own paving. The work was done in sections across a period of five years, to minimize the inconvenience of highway work to motorists. 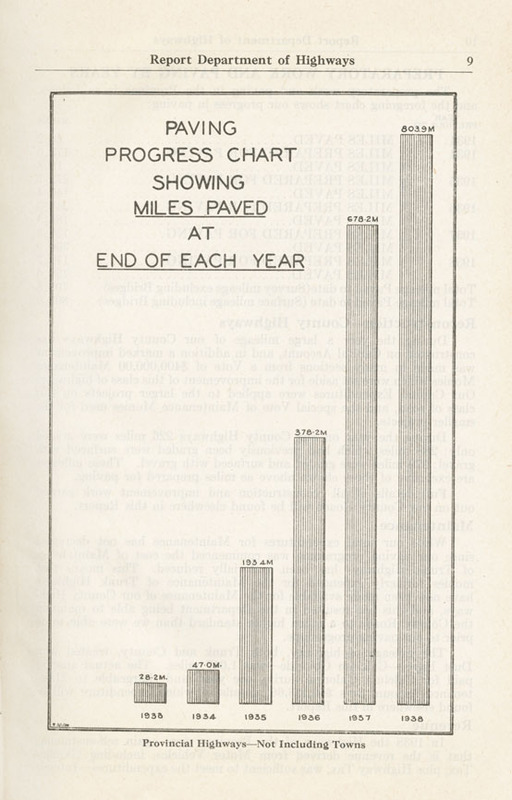 By 1938, all 804 miles of the Trunk Highway System were paved, and work had begun to pave the secondary County Roads.